And we’re already exhausted. Nick either has a lot of patience or a really good masseuse because there have already been many a cat fight, and the Bachelor himself seems as cool as a cucumber. After a month back at the Bachelor Mansion, here are our thoughts thus far on Nick’s lovely-ish ladies. During Bachelor in Paradise Josh’s voiced over moaning became almost as famous as the Josh/Amanda coupling itself. This season, it’s Corrine’s snoring that’ll make you cringe. Seems the producers liked the reaction from Josh’s performance so much that they chose Corrine as their exaggeratedly voiced victim. Though, let’s be real, her snoring isn’t the most cringe worthy thing we’ve been watching these past four weeks. Maybe Corrine and Chad can bond over a cup of coffee…or a bowl of cucumbers prepared by Raquel? So else sees Vanessa and both Danielle’s making it to the end? Who sees both Taylor and Corrine not making it too far out? It seems the show will milk Tay and Cor’s feud out for at least another episode longer, but even though the teasers hint one will go home this week, it’s looking like neither will last very far altogether. Nick just blew our mind by going way out of order. 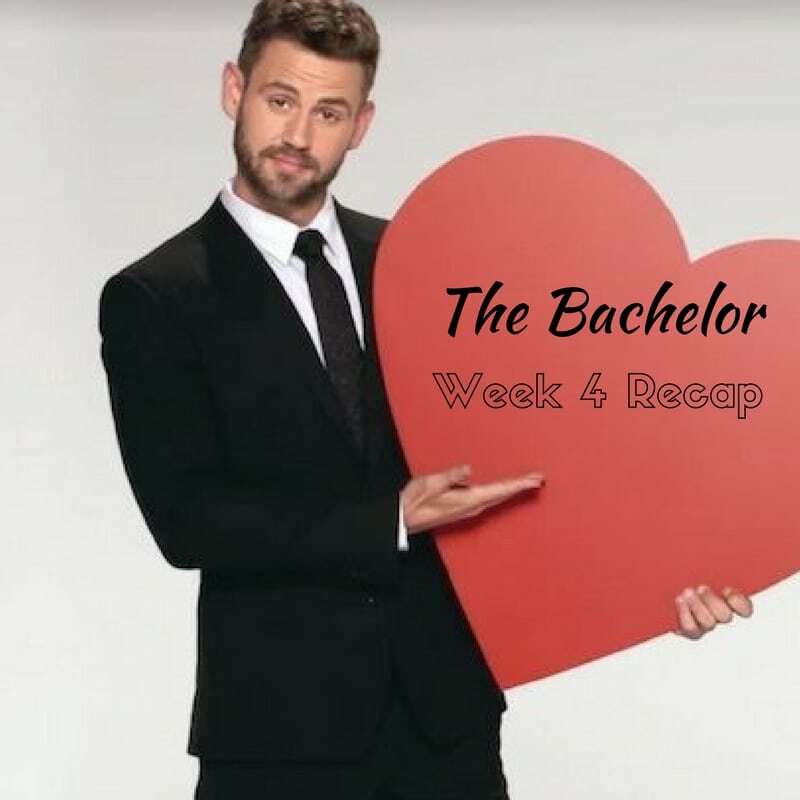 Normally saved for at least the final 6 or so, Nick brought his ladies to good ol’ Wisconsin only four weeks into the Bachelor romp. Got to admit though, that we loved how he took Raven to his sister’s soccer game. How freaking adorable! 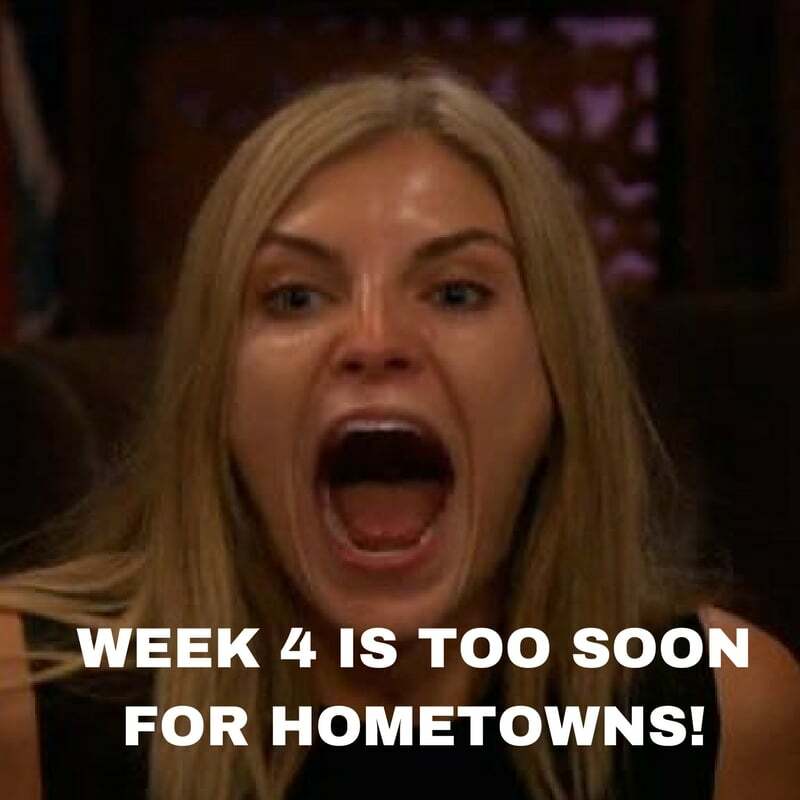 For some laughs, Bachelor Nation likes to provide us with some funny, comedic relief to ease the stress and drama of the afore-watched episode. We realized that last couple of episodes has ended with some interesting interactions with Alexis, everyone’s favorite, shark-clad, aspiring dolphin trainer. This episode ended with an existential debate on aliens and which one of the girls may be called back to the mothership one day. 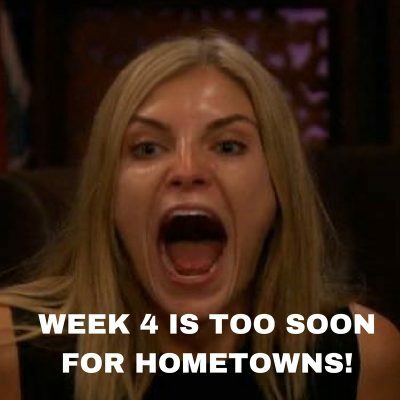 We’re eagerly awaiting Week 5 to see who will go home and who will survive another week. This entry was posted in Members Only: A blog for chics and Greeks alike. and tagged Lifestyle, Reality TV, sorority, The Bachelor.